With his 2010 directorial debut Beyond The Black Rainbow, filmmaker Panos Cosmatos’ established himself as a lover of melancholy, neon lighting, and heavy synthesizers. Eight years later, Cosmatos does not disappoint with the sensory overload that is his 2018 film Mandy. The film is essentially split into three acts. In the first act, we are introduced to Red Miller (Nicolas Cage) and his girlfriend Mandy Bloom (Andrea Riseborough), who live in relative seclusion in the Shadow Mountains in the year 1983. While they lead a quiet life, the love between the two is anything but. From the first time they are on screen together, it is evident that the couple are completely and utterly fascinated with each other. 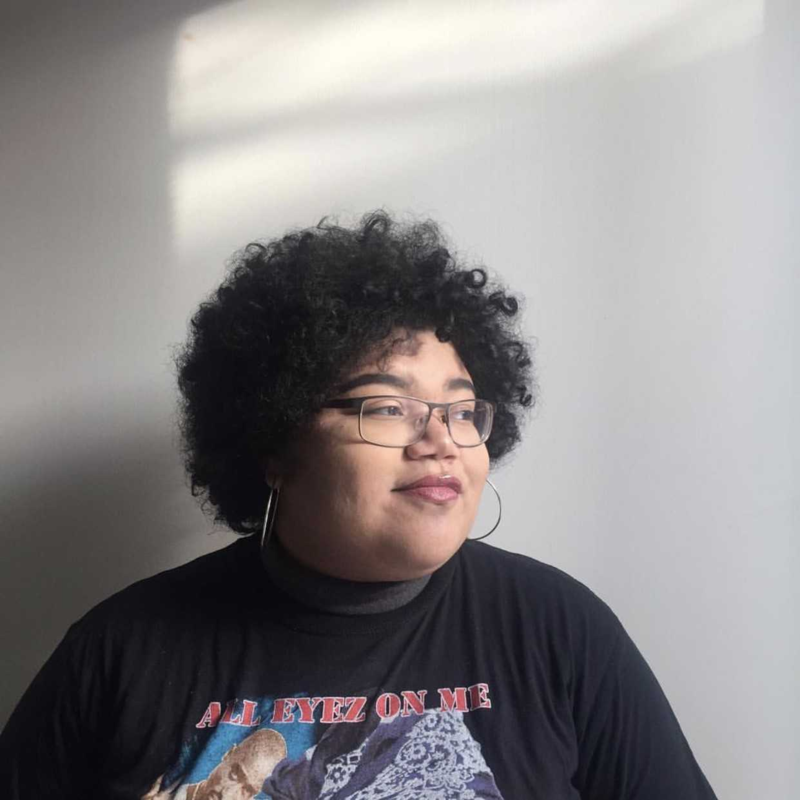 While Red works as a logger, Mandy works as a cashier at a gas station, and on the side works on intricate fantastical art. While on her way to her day job, Mandy is spotted by a cult leader, Jeremiah Sand, who then becomes obsessed with her. Jeremiah entrusts one of the members of the his cult, along with a demonic biker gang called the Black Skulls to kidnap her; setting off the second act of the film. As the title character of the film, it would seem that Mandy Bloom would be a key character in the film, and while she is essentially the driving force of the plot, she is only steadily present throughout 51 minutes of the films 2 hour runtime. Mandy’s abduction – and later death – is only used as a driving force for Red, as he is consumed with grief and becomes a ruthless killing machine, tracking down the Black Skulls and later, Jeremiah Sand. Mandy’s “death by fire” is horrific and drawn out to the point where it feels unnecessary, and as this is happening, the camera pans to a distraught Red, to send home just how horrifying this act truly is. 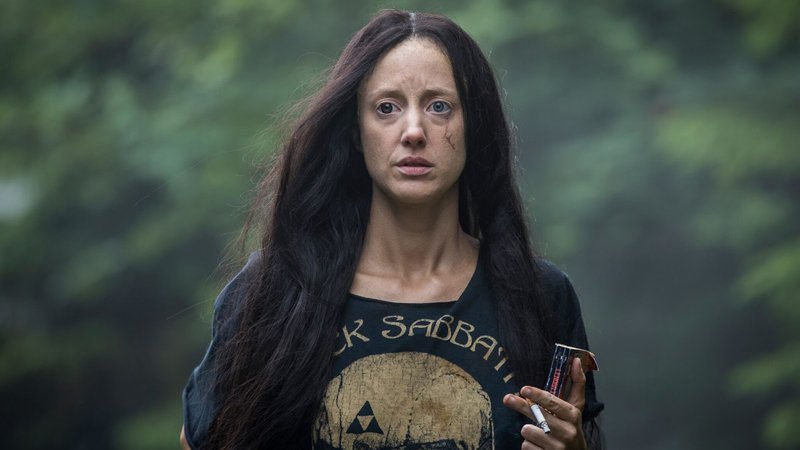 While Cage’s performance in act two is filled with a rawness that most don’t believe him capable of, it is Andrea Riseborough’s portrayal of the title character Mandy that is the most captivating in the film. With one blue eye, and the other seemingly black and soulless, she exudes mystery. Yet, when she’s with Red she emits a softness that wouldn’t seem to come from her character at face value. It is apparent that Mandy has gone through some sort of traumatic event – she has a jagged scar on the left side of her face and she tells Red a story that involves her father killing baby Starlings in front of her as a child – and that her secluded life with Red is helping her cope. This makes the fact that she doesn’t survive the film, devastating. It is evident that for Cage to flip the switch within the film, Riseborough’s Mandy must depart from the story. While this is necessary for Cosmatos’ story to thrive, it is ultimately a failure to the title character. While Mandy’s fate is heartbreaking, her final seconds ensure that horror fans won’t soon forget the haunting laugh that explodes from an otherwise subdued character, in her final moments. While, Mandy’s vibrant colors combined with a haunting Jóhann Jóhannsson score and a knock-out performance by Nicolas Cage, makes it one of the most beautiful and entertaining films of the year, the story fails its title character. Andrea Riseborough gives one of the strongest performances of her career as the hypnotic Mandy, which deserves more credit as it’s been overlooked by Cage’s portrayal of Red. While the film itself is one of the highlights of 2018, as a woman who enjoys horror, it’s hard not to feel torn between loving the theatrics, and also feeling devastated by where Mandy’s character arc leads her; punished and ultimately forgotten.